omg, lol. that is too cute!!! Only half way? You've got huuuuuuge holidays! How many months??? Fantastic, we have been waiting for this. Roll on the rain, I can feel another fun afternoon involving small children, pins and happy faces coming up. Thank you. I can't believe you are only half way thru your summer break. My kids went back to school last week, thank the Lord!!! Our schools here in the north started this week. But still I think it is a good project for involving the kids. That mousey is super cute! I know a little girl who will want a whole gang (what do you call a group of mice?). Thanks for the tootie. What a fun little project---thank you so much! Thank you for sharing your sweet pattern. I think these are definitely in our future. That's darling! 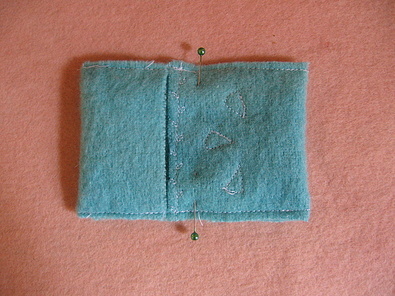 I have to ask - what's the secret for sewing such small bits on the machine? So so cute!!!! Thank you for sharing your pattern!!!! I have two more weeks to go and then my 17 and 15-years old spoiled brats are going back to school. Nice mouse, by the way! Oh My! How cute! Thanks for sharing! Is there a shared pool on flickr or anything like that so we can all have a nosey at each others mice & see how different they all are...? & how fast they breed? Oh thank you so much for sharing this, Lyn! You always come up with the most wonderful creations! 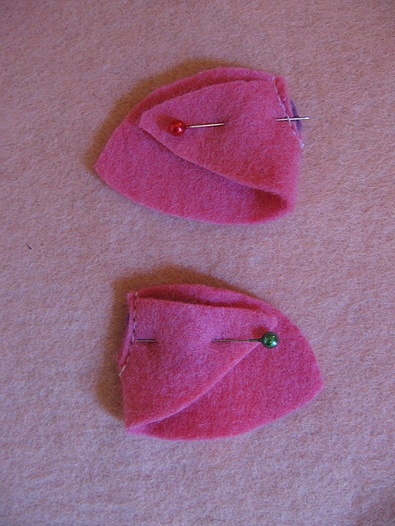 My daughter will LOVE making these too - she's only 5 but good enough on the machine not to sew her mouth shut. I'm thinking duct tape might be quite effective for my son though. I noticed the boiled wool blankets for the bed - I'm in the middle of using those to make a bunny if my pattern isn't too wonky. Thanks! Oops put in wrong info on my details before. By the way, if I made them with my class would that be a school of mice? again, everything I love here...clever craftiness, and laughter. too adorable! OMG that is cute, cute, cute and even cuter than cute!!! this is great, thank you! 2 down and well, you know mice! Yay! I will give the pattern to Beritt. She will be so tickled. The gnome she made the other day will appreciate having a wee pal to chase/play with/torture. Do gnomes chase and play and torture? Oh good heavens. Great tutorial! Thank you! Oh he is lovely! Can't wait to make it - thank you for putting on so many clear photos. Hi I love your blog and visit it nearly everyday. I've tagged you-hope you don't mind. you don't have to take part of course if you don't want or if you have already done it before. Thanks for the tuto, your mouse is very adorable and pretty!! I just wanted to say that my son (6 years)and I made your mousie on Friday. He spotted the mouse while I was reading your blog and asked if we could make it. Why not? My son did most of the sewing by hand and now has a little playmate that he's been showing off to his friends, way better than the latest pokemon or transformer or whatever else is going around. Thanks for the fun! Thank you so much! My daughter will love making one of her own. Come see our Puppy Tutorial that she made. Thank you so much for doing that for us! Do you think an eight year old girl is too old for a 'mousey in a blanket'? 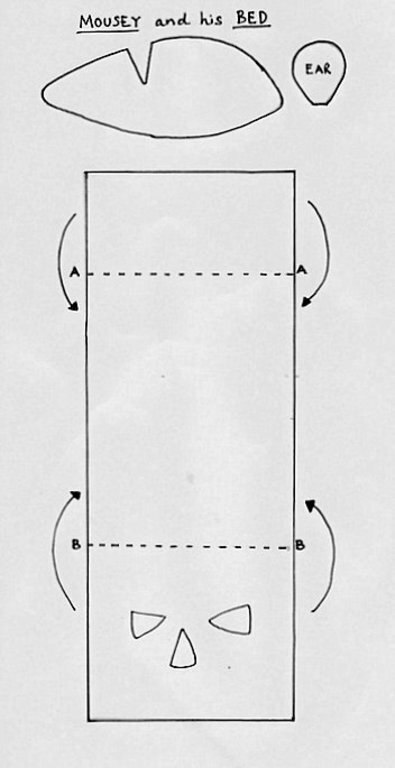 Oh goodness, I'm printing out the pattern right now. Thank you. Leil is going to squeal. I like to sew some for my class in school - they just start learning letters and this is wonderful for M like Mouse, even in German :-) M wie Maus. I love mousie!! He is so cute - thank you for sharing your creative genius!! That is so cute. My nieces would love a little mousie. Thank you so much!!! Just wanted to say that I love your work. Thanks Lyn! 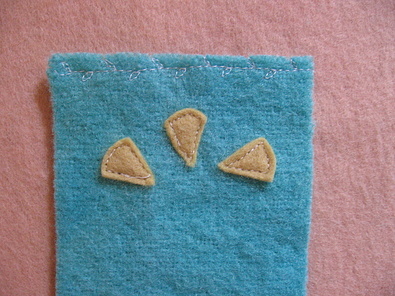 Made three of the little blighters on Monday, when the heavens opened on us. Managed to finish them (after several neurofen) and the kids are so proud! that is totally, totally cute! thank you for the instructions and pattern, I can't wait to try it. 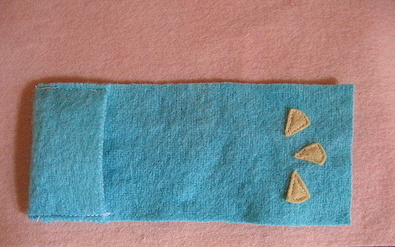 Thank you so much for this wonderful idea and pattern. I have made two tonight and can't wait to give them to my children when they wake up in the morning...I can feel an addiction coming on though...they may end up with an extend mousling family! 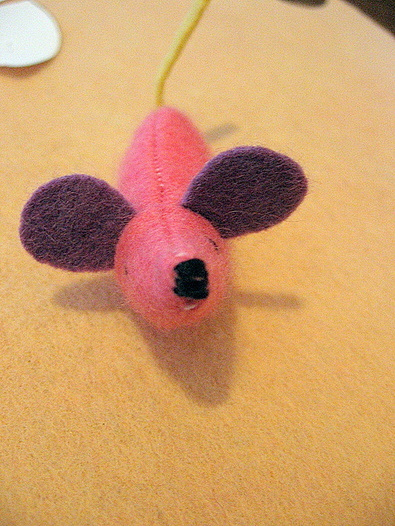 this is a wonderful tutorial, my sister wanted from me a felted mice for her cat, so i am a lucky person, i found this tutorial very rondamly ;) I will do it very soon. Anyhow, I stopped in to say I love this little mouse! I found him via Megan at The Scent of Water. The kids & I are going to make some! Thanks for sharing. We're making mice in the morning. DD went to bed counting down the hours until she gets to make one! DS was trying to calculate if he didn't stop to eat..how many could he make in a day! We could be overrun! Still a week to go of holidays here...and I hear they breed well! Thank you for the marvellous instructions. The kids are SO excited. 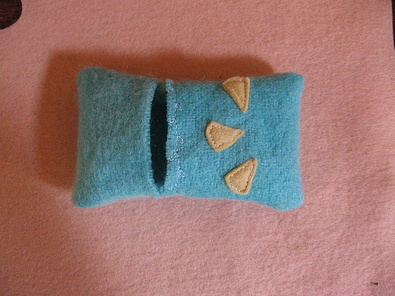 Hi - I have peeked at your blog for a couple of months now since stumbling across the wonderful world of crafty blogs. 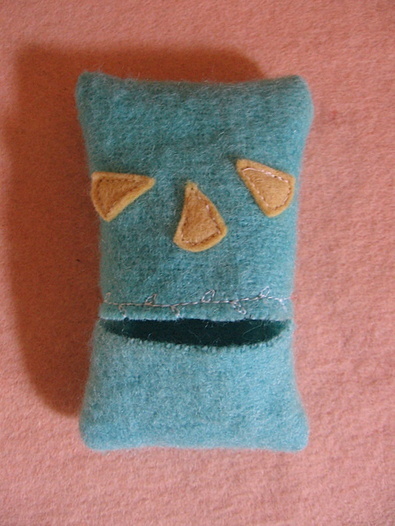 I used to sew as a child and teenager and always had a project on the go but it all lapsed for ooooh too many years. I am now inspired and my 6 year old twins couldn't go to sleep the other night before their mice were ready (and one for their friend that was staying over). Thank you! 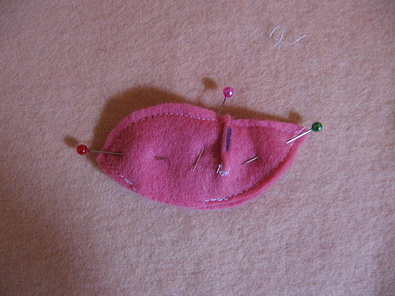 if I didn't loathe mice so darn much I would make one of these. thank you! 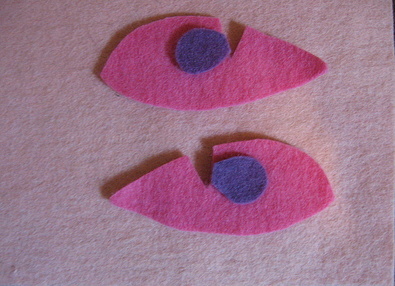 I have already made 2 as gifts. I just LOVE the teeny beds, so cozy for the mouseys. Hello. 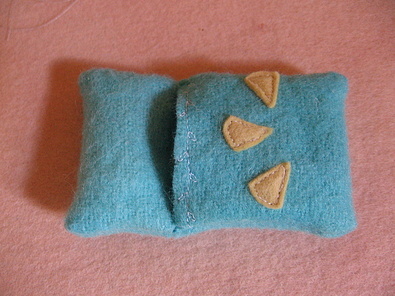 Last week I finally had the time to sew my own mousey and its bed. I think they are supercute! That is so cute - my 2 year old daughter Mhara is in love! 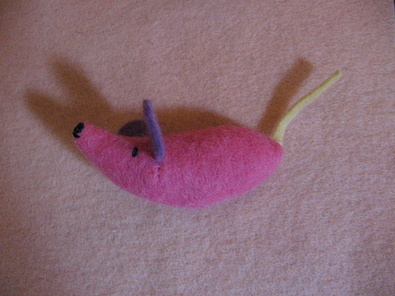 I found you from someone else's blog and love the mousie! These are sooooo adorable! 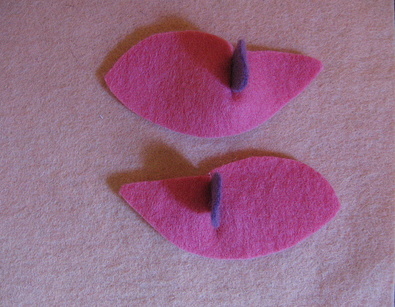 I have made some of my own mice this morning, linked to you, and posted pictures of my mice...thank you so much for the CUTE idea! Ah! Thanks for the little mousie tutorial! My granddaughter has been so upset - they have a pet mouse in her class at school and at the end of the semester SOMEONE gets to take mousie home BUT not her - mum says NO! 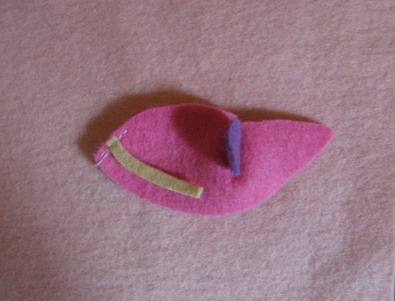 :( Perhaps a little felty mouse will make it better? TFS! I love it! The mouse looks so cute poking his little face out of the little bed. How nice it is!!!! !Thank you for this tutorial. I love these little mice! I'm going to make 30 of them for my friends 30th b-day! Thank you for sharing the pattern with us!! I am halfway a period of desperate attempts not to panic, having heard that I might have lungcancer in a terminal stage, and having a 2 year old son. So, I can't sleep. I have drifted on the sea of sleeplessness and stranded on your website. And thank you, thank you, thank you, for making me laugh out loud and grinning so much. It helps. I am going to eat something completely senseless and read and laugh some more. Life is good! With dark humour and dark chocolate. 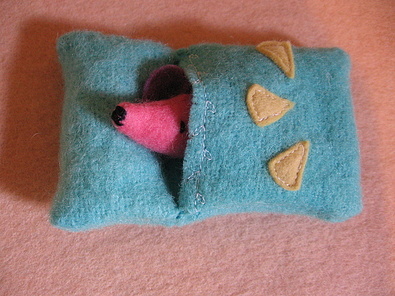 Oh I must make a mouse in a bed! So cute - thanks so much for the instructions.